It’s human nature to want to have our own unique identity. Whether it’s through a choice in clothes or hairstyle, everyone has their own way of making sure they stand out. However for brands, things just aren’t that simple. 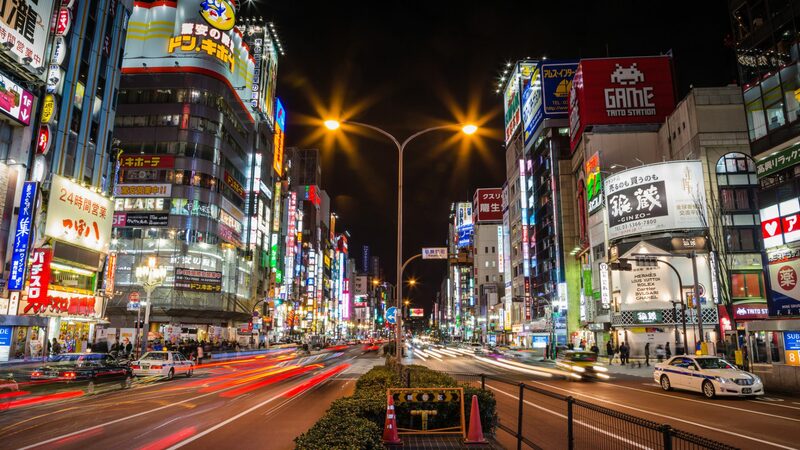 Companies all over the world can spend weeks, even months, and in many cases thousands of pounds working with branding specialists and marketing strategists to perfect their brand mark, and doing it justice is fundamental to their success. An eye-catching logo goes a long way to helping your brand stand out, and in fact, some of the biggest companies in the world are recognised by the logo on their bespoke signage alone without the need for words. If, for example, you’re travelling throughout an unfamiliar, distant land – the glowing arches in the distance may be your saviour. No words are required, because this signage is etched into our minds wherever we go to the point where it is indicative of only one thing – and this is what every brand wants to achieve in its lifespan. A proven marketing method that has been around for centuries, bespoke signage is the ultimate way to put your brand directly in front of the audience, and in style. The message you are communicating is all down to the design, and good design can never be underestimated as it says more than you will ever know. Not only does bespoke signage help you to stand out, popularise your brand and stay ahead of competition, but recognisable signage goes a long way to achieving repeat business, as people prefer to buy from a name they are familiar with. The guy standing by the roadside in the city dressed as a pizza holding nothing but a sign is exactly how you should be thinking about bespoke signage. Effectively, it is like an employee advertising your business out on the streets but, unlike the pizza shop employee, is a permanent fixture showcasing your brand 24/7. For small businesses where budgets may be limited, this is an ideal alternative to internet promotion, which might be a fleeting moment of exposure to the consumer who will undoubtedly be swamped by a wealth of information. Once any initial design and production costs have been tackled, long term, bespoke signage is both simple and inexpensive to maintain, and an ever-green tool. 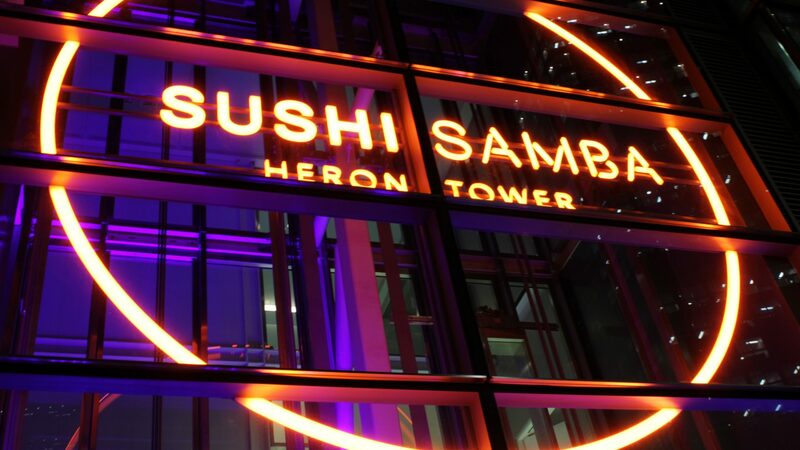 Our work on Sushi Samba‘s signage in London helped to articulate the brand and with it lit up 24 hours a day, customers are able to recognise the glowing signage from afar. Out on the high street, unique signage can really help you to stand out amid the competition and attract an audience’s attention. Whilst many choose to include a strapline or marketing slogan, some of the most successful signage opts to simply bring a bold, custom design and its typography to life, illustrating the brand’s message beautifully with well thought-out lighting. Whilst increasing sales is the ultimate goal for any brand on the high street, considered bespoke signage can also serve as a handshake of sorts, introducing new footfall into the store. To achieve such success, your signage needs to be bold, eye catching and representative of you, whoever you are. Your brand is your corporate identity – but that needn’t mean it is confined to the dulcet tones of corporate life. 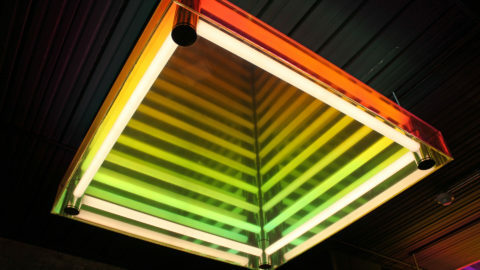 Working with a designer who can help capture the uniqueness of a brand is one thing, but bringing it to life with an experienced bespoke lighting company is key to achieving something that resonates with the world.